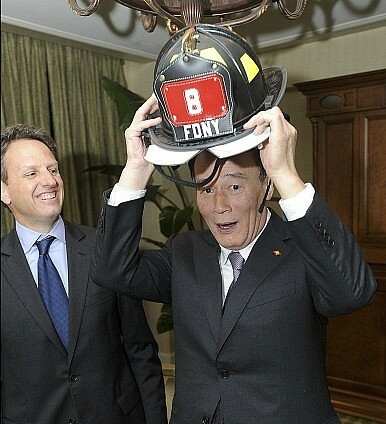 Wang Qishan receives a firefighter's helmet as a sign of his reputation as a firefighter. The thorny question facing China’s anti-corruption campaign: how far up the chain of command to go. On May 22, 2015, the Central Commission for Discipline Inspection under Wang Qishan announced the capture of the 100th “tiger” — the 100th corrupt official with a rank of vice minister and above. At 11:30 pm that day, it was announced that Yu Yuanhui, a standing member of the Guangxi Zhuang Autonomous Region Party Committee and party secretary of Nanning (the capital of Guangxi), had been placed under investigation for “serious violations” of party discipline and state law. But while Yu’s case is historic, it also poses a dilemma for the CCDI and Wang. Roughly speaking, there are three kinds of corrupt officials in China. First, there are those who take advantage of their office for monetary gains. Xu Caihou, former vice chairman of the Central Military Commission and Politburo member, is a good example. It’s been reported that he ignored those who offered him 10 million yuan ($1.6 million) for a promotion to the rank of regional military chief in favor of those who offered him 20 million yuan ($3.2 million). In other words, he promoted the highest bidder. This kind of corrupt official strictly follows the money in selecting officials or officers for promotions. The second type of corrupt official: those who harbor undue political ambitions. Zhou Yongkang, a former Politburo Standing Committee member who was in charge of the security apparatus in China, falls into this category. It is likely that he and his family members obtained financial gains by leveraging his power and network. But Zhou’s downfall was largely due to the fact that he was closely associated with Bo Xilai, the former Politburo member and party secretary of Chongqing who aspired to become a Politburo Standing Committee member, possibly at the expense of Xi Jinping. Zhou’s primary sin was not economic corruption, but political factionalism. Third, there are also those who faithfully executed government policies, resulting in huge human and social losses. Yu Yuanhui could very well be an example of this category. Born in Guangxi, Yu was a rising star, particularly as a member of the Yao ethnic minority. He was admitted to the 17th Central Committee as an alternate member in October 2007 while he was mayor of Wuzhou City. Yu was then awarded the rank of vice minister at the age of 44 in 2008 when he was installed concurrently as a standing member of the Guangxi Party Committee within days of his appointment as party secretary of Wuzhou City. After only 11 months, in January 2009, he was promoted to secretary general of the Guangxi Party Committee. According to an online report, Yu was responsible for massive land confiscations in Guangxi, resulting in deaths and serious injuries of local people, while he was secretary general of the Guangxi Party Committee and the head of the Coordination Office of Mass Incidents from January 2009 to May 2013. He allegedly organized police raids at villagers and covered up bloody conflicts when these cases were exposed in the media or investigated by Beijing. However, Yu was not acting alone. He was carrying out instructions from his superiors, especially the party secretary of Guangxi. During much of the period in question (from November 2007 to December 2012), Guo Shengkun, now a state councilor and minister of Public Security, was party secretary of Guangxi. Wang Qishan’s dilemma is whether he should stop at Yu Yuanhui as if this were an isolated case or pursue someone else at a higher level. If Yu is guilty of following orders, should Yu’s boss also be held accountable?